The Call of Duty World Championship 2015 is just months away. With that being said, North American teams are seen to be the fan favorites and most dominant during these events. At last year’s World Championship, a team from Australia by the name of Trident T1 Dotters proved many wrong. Can it be done again by a non-American team this year? T1 Dotters is a competitive Call of Duty Australian team that ended up winning Australia’s Regional Qualifier for the Call of Duty World Championship 2014. The team was then placed into Pool Play’s Group Delta for the World Championship, consisting of: FaZe – United States, SK Gaming – Europe, and Aztek Gaming – Mexico. T1 Dotters vs. FaZe: won 3-2. T1 Dotters vs. Aztek Gaming: won 3-0. T1 Dotters vs. SK Gaming: won 3-2. The team was able to successfully place first in their Pool Play Group on day one, sending the them to the Winner’s Bracket and guaranteeing a Top 16 finish at the event. T1 was one-of-three foreign teams to take down a North American team in Pool Play. T1 Dotters vs. Vitality Returns: won 3-1. T1 Dotters vs. Rise Nation: won 3-2. T1 Dotters vs. OpTic Gaming: lost 1-3. After beating Rise Nation, T1 was able to guarantee a Top 6 finish at the World Championship with $50,000 in prize money. The team later lost to North America’s OpTic Gaming, forcing them to the Loser’s Bracket. Regardless, the team had yet to lose a Search and Destroy game type against any team during the entire event. The team continued on to Championship Sunday, being the only non-American team out of six professional teams, which were compLexity Gaming, Team EnVyUs, OpTic Gaming, FaZe Pro, and Strictly Business. T1 Dotters vs. Team EnVyUs: lost 0-3 – eliminated. T1 Dotters vs. FaZe Pro: won 3-2 – placement match. 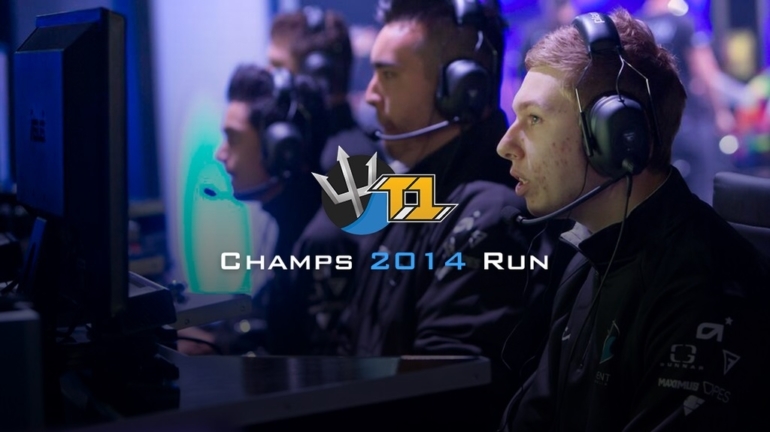 Championship Sunday consisted of T1’s elimination and placement match. The team would go on to be eliminated by Team EnVyUs from the event. T1 went on to beat FaZe Pro for 5th place along with $75,000 out of 32 professional teams, being the only non-American one. Worth noting that the T1 Dotters only lost one Search and Destroy map the entire event and it happened against Team EnVyUs in their elimination best-of-five series. This went on to show that Search and Destroy is the most important Call of Duty eSports’ game mode, and that it wins championships, or gets close to them. Soon after the event, the Curse Gaming organization picked up T1 Dotters from the Trident organization. From that point on T1 Dotters would be known as CurseAU. Recently, T1 Dotters has appeared to have returned no longer under Curse, looking for a new organization to represent heading into this year’s qualifier. We’re hoping to see the current T1 Dotters team make another run in this year’s Call of Duty World Championship ANZ Qualifier, and participate within the tournament. Within the last few years, European teams have come to rise in the Call of Duty eSports’ scene. Many contenders come to mind such as Epsilon eSports, TCM Gaming, and Team Vitality. Team Callidus look to be the top contenders for the Brazilian Qualifiers consisting of Call of Duty Brazilian Champions and Electronic Sports World Cup players. Many are hoping to see the return of an Australian team in this year’s event. A likely contender from the ANZ Qualifier will be the favored T1 Dotters, hoping to make another run at this year’s event. We were able to get in touch with professional shoutcaster and presenter, Dallas “BioAcid” O’Donnell to ask him a few questions on T1 Dotters’ success last year, and possible contenders for this year’s championship. Being from Australia, BioAcid has a lot of experience within the Australian eSports’ scene compared to most. *Note that Q: Question, A: BioAcid’s Answer. Q: What did you think of T1 Dotters’ run during the Call of Duty World Championship 2014, and what do you believe really set them apart from other non-American teams that were eliminated from the competition? A: Like most of us at the time, I was surprised. I knew both T1 and Immunity were strong teams for ANZ standards but to do what they did on the international stage was amazing to see at the world championships during 2014. I think one of the key things that set them apart was not many other teams really took note of what we do down under. Meaning, they don’t or didn’t really follow our scene to keep an eye on the top teams who could perhaps cause upsets. One of the other things that I noticed about T1 was their overall hype or ability to stay pumped during some down moments, this was mostly impart thanks to Issei as he really lead the team in the hype department during both the ANZ Finals and the World Championships in LA. Q: How do you believe the current team will perform at this year’s Call of Duty World Championship ANZ Qualifier only having two of four original T1 Dotters’ players? A: That’s a hard question to answer, as at the time I’m writing this answer I believe they now only have 3 members in the team, two of which being Issei and Damage whom were part of the original T1 line up. Until I see their new forth I won’t really know how to judge the team as everyone plays so differently with the new aspects / game modes in Advanced Warfare. I think the experience of Issei and Damage will help them no matter what, but could they do again what they did in 2014 ? I’m very unsure. Q: Search and Destroy really seemed to be T1 Dotters’ strongest game type, which lead them to win multiple 3-2 best-of-five series. Do you believe that within this year’s Call of Duty title, Advanced Warfare, that Search and Destroy plays as a dominant role with the new eSports’ rotation? A: I think Search and Destroy will always be “The gametype that wins championships”, that said though, until we see what 32 teams from all around the world can do with the new gametypes / abilities and how they play each role it could be a different story. While many teams might think they have the tactics done pat for Uplink, we could see a team from an unknown place perform things in that mode that other people simply haven’t thought of. Granted that might not be the case and it may well still come down to those 5-5 score lines in S&D heading into the golden eleventh round to find out who really wants the “W” the most. Q: Outside North America, who do you believe will be the strongest contenders for this year’s championship? European teams seem to come to mind. A: This question is always so hard to answer, as for so many years, the NA scene has been the pinnacle of skill level for Call of Duty. Granted we have seen upsets and curve balls, but at the end of the day, an NA team always seems to prevail. If I had to say a few teams, I’d like to think the new Mindfreak (AU team formally Immunity) which the addition of Denz replacing Naked now could perhaps do a good job. Seeing as it’s also Fighters first chance at CoD Champs now being 18+ however they still need to qualify first. Another team like iG (NZ) do have a good skill level, however I feel that the skill gap between the regions is just too great and might see them struggle a bit if they do head over to LA. You’ll always have your strong favorites from the EU region too who have played at a few different events around the world and do have the knowledge/ability to come up big when needed, but if you were to ask me who I think would perhaps take CoD Champs 2015? Any betting man would say an NA team I think. That said, I’m more than happy to be proven wrong. What non-American team do you believe will surprise many at the Call of Duty World Championship 2015? Let us know.